Do you want to know where is your kid right now? Or a friend? 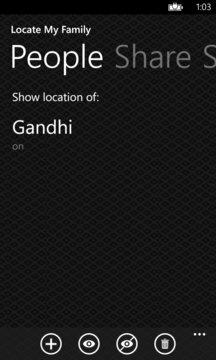 Locate My family let you know position of a person having windows phone with this app installed. Download the app. Give your location access to another person from share panel. Enable Background location reporting. 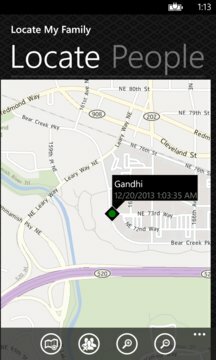 Now that person can know your location on map anytime using same app in his phone or through http://locatemyfamilyapp.appspot.com/ website. You can Enable or Disable location access to specific person anytime. -- Anytime Location Access On /Off. -- Web interface to access location information from other mobile os or desktop. -- Your location Information is never sent to any 3rd party website(We don’t own any website at all) . It will be stored in your Skydrive only. -- Location information is not shared with anyone without your consent. -- You can add any number of persons. Note:As per windows app guidelines we can update location information every 30 mins if background reporting is enabled. However whenever app is opened it will update location information immediately. -- Cross platform support for Android, windows 8 and web. It will work with any mobile. PLEASE NOTE: If you face any issue personal message us in our Facebook page instead of writing it in reviews because there is no way i can communicate to you in reviews to resolve error. Kindly Give us suggestions about this app so we can improve it. As this app is free, Give us support by giving Good ratings to motivate us to improve it further. you can reports any issue or feedback through that page. - Integrated Web interface to look for location information from Other Mobile OS and Desktop.